I’m so excited to share this recipe with you! I’m very proud of this creation because, like with the Banana Peanut Butter Bites (shared on my weight-loss blog), it’s all my own–I didn’t even do an internet search for recipe inspiration before throwing it together. This is very unlike me because baking is an exact science and if you don’t get the liquid to dry ratio right, you can end up with a dense, dry, or mushy result. I think I’ve finally been baking long enough that making my own recipes is becoming intuitive. This makes me happy. I made this recipe with two goals in mind. I wanted it to be as healthy as possible while still being as tasty as possible. I’ve found with baking, the healthier you make a recipe, the more unpalatable the taste. Muffins, however, seem to be a lot easier to healthify without getting too healthy-tasting. These muffins are low-fat, cholesterol-free, naturally sweetened, and are still moist and delicious. The only concession I made for taste/texture over health was using more all-purpose flour than whole wheat because it yields a nicer, less dense & dry, crumb. The ripe mashed banana keeps the muffins moist without a lot of added fat and I chose to use agave nectar to sweeten them, since it’s natural and the flavor is so mild that it wouldn’t compete with the chocolate & banana flavor like honey or maple syrup might. I also left out the egg since I had success with it before, and actually liked the texture better than when I had tried it with the egg, giving an added bonus of making the recipe cholesterol-free. You could certainly turn this recipe fat-free and use more whole wheat flour, and I have done both (I have made three batches of these so far, each with a different amount of fat and liked the one here best). It results in a more rustic, dense muffin but we had no problem eating them up in less than a week. They are great in the morning with a steaming cup of coffee and I find that one muffin, especially with coffee or milk, keeps me satisfied for hours. Let me know if you try these and what changes you made. I’d love your feedback! 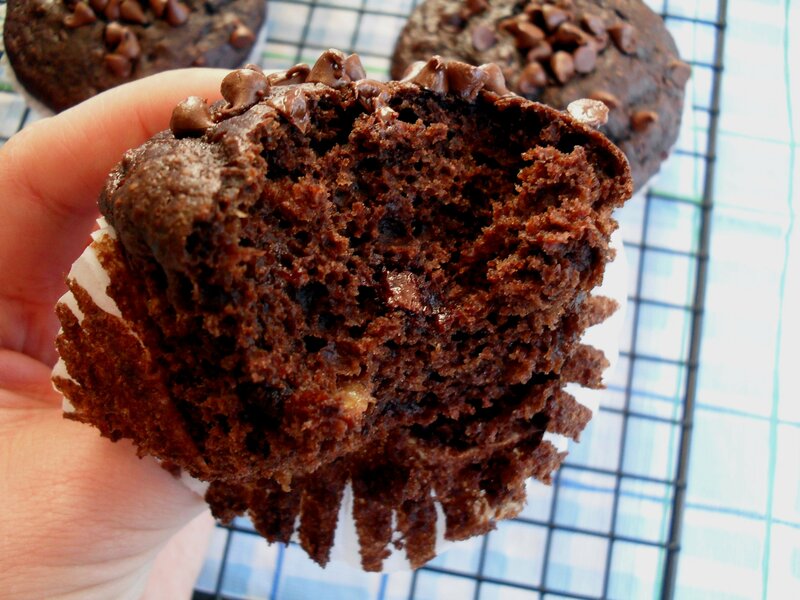 Dutch process cocoa gives these muffins their deep dark color & chocolate flavor. You can find it online and in specialty stores, or you can get Hershey’s Dark cocoa powder at most supermarkets. Preheat oven to 350 degrees F. Line a 12-cup muffin tin with paper liners and set aside. Sift dry ingredients together into a medium bowl and stir to mix. Whisk wet ingredients together in a large bowl. Stir dry into wet just until moistened, then fold in 1/4 cup mini chocolate chips. Divide batter between prepared muffin cups and sprinkle about 1/2 teaspoon chocolate chips in the very center of each muffin (chips will spread out as the muffins bake and rise). Bake about 20 minutes, or until toothpick comes out clean when inserted in the center of one. Cool on a wire rack. Store in an airtight container (I use a large Ziploc bag). These freeze very well–I like to take one out of the freezer before my shower in the morning and by the time I’m done getting ready for work & am ready to eat, it has thawed. If you are in a hurry, about 15-30 seconds in the microwave will thaw and warm your muffin for you. These are from the fat-free batch with 1 cup whole wheat flour and 1/2 cup white. They were more dry and dense, but still yummy. Posted in Breakfast, Lighter Fare and tagged banana, cholesterol free, double chocolate, healthy, low-fat, muffins. Bookmark the permalink. They look awesome! The kids would love them, thanks! 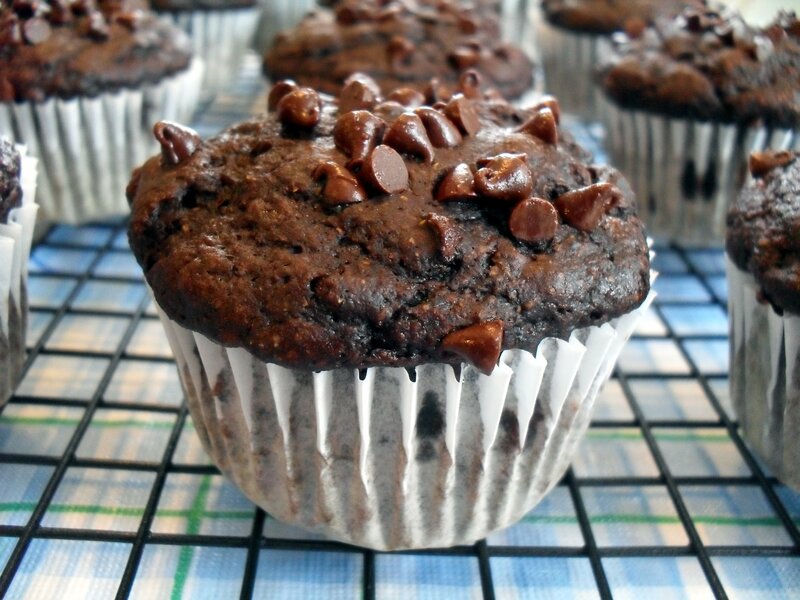 These muffins look scrumptious and I love that they are so healthy! Veronica, congrats on this recipe. On the recipe you said was a little dryer, maybe try some applesauce in the mix. It’s suppose to make things moister, and the natural sugars are better for us that it would bring to the recipe. They look yummy! Good idea, Miss R!! In this recipe, I’d suggest adding more banana to up the banana flavor. Now why didn’t I think of that–LOL! Veronica, these look amazing! And kudos on your own recipe. So many bloggers (me) just recycle recipes, so it’s great to see you trying your own thing. Gives me some courage to try my own as well. Hmmmm, that sounds intriguing! I never would have made a lemon muffin b/c, well, I’ve never heard of their existence! Lemon cake & cupcakes, sure, but not muffins. Now I’ve got my thinking cap on. I will have to try that next. My kiddo would love these, he likes chocolate and banana :) They look yummy! these look and sound great!! 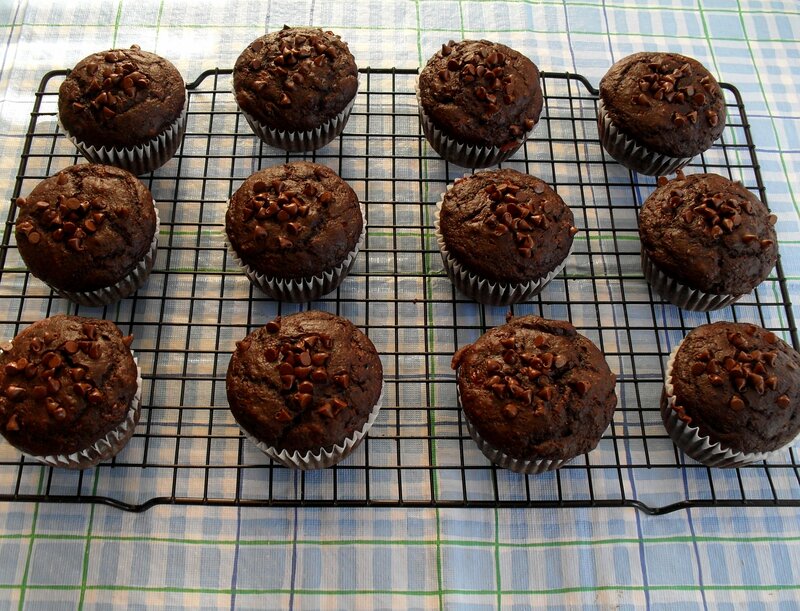 Finally somebody who likes a rustic and muffin-y muffin compared to cupcakes or cake disguised as muffins…. not that cupcakes are bad, just that when I want a muffin..I want a muffin. You know.. rustic and not so fine crumbed…. Just to warn you, when they’re fresh and hot out of the oven, they are more cupcake-like and tender. After a day in a ziploc bag, they turn and even prettier darker color and are more firm but still moist and definitely not cake. beautiful!!! they look so wonderful! and great job! you are a scientist as well as a baker!! yea!! bravo!!! Haha, well maybe a scientist in the kitchen. Thanks, Sue. 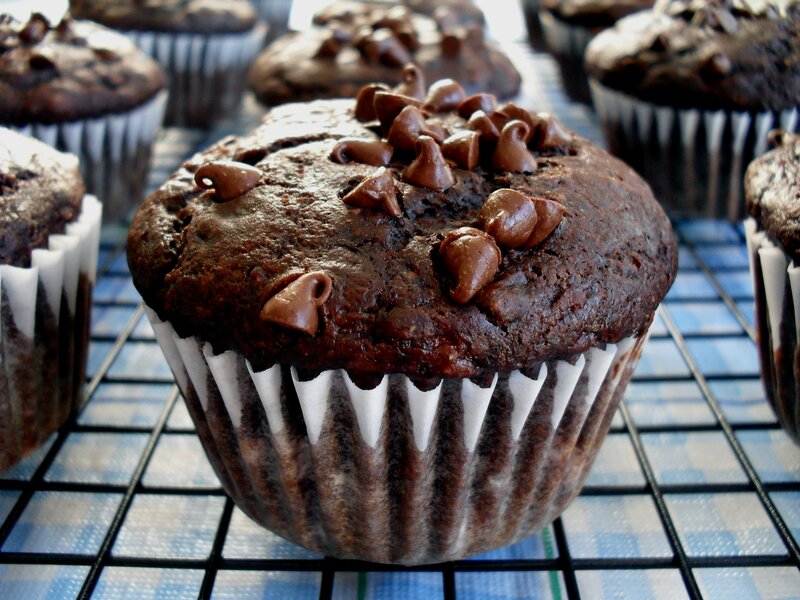 I believe this is actually Double Chocolate Banana Muffins‏ Mark III. I was really with versions III and I.
Yup, this was the 3rd version. The first was completely fat-free and had more whole wheat flour. The second had more fat than this one, more whole wheat flour and more chocolate chips and just was not as good for some reason. This one kicked all their butts IMO. lol as soon as I saw those luscious muffins, I was gonna comment, “But aren’t you on a diet, dear Veronica?” So it turns out they are healthy and guilt-free! Gosh, I can’t even tell! Just don’t say a word, and people will think they are gobbling down the richest dessert ever. ahaha–I tricked you. ;) I like my sweet treats and had to come up with something that was mostly natural and not too over-the-top calorie-wise. It makes me happy to have one in the morning. I’m glad you’re getting the hang of developing your own baked goods recipes! It is an exact science, but it’s actually quite an easy science to master with a little practice. :) These look great! Can’t wait to make these muffins! I can’t believe you created your own recipe! I have no been brave enough to try that. Sometimes I have a hard enough time following an already written one :) These look great! When I get a chance, I’d love to make them for my husband. I’ll let you know what we think! I just decided to go for it, and thankfully it worked out. Actually this is the third version of the muffins b/c I made them fat-free to begin with and even though we liked them, they are better with a little fat. I hope you enjoy! Savory plantains? Did you make them? I need to know? Love love them! Soak the plantain pieces in a bowl of salted water for about 15 minutes. Drain well. Heat the oil in a sauté pan or skillet over medium flame. Working in batches, sauté the plantain slices until they are cooked through but not yet browned, 10-12 minutes. Next, flatten the plantains with a rolling pin then put back in the oil until browned. Add the plantains, garlic and a little bit of olive oil to a large mortar or bowl and mash with a pestle or potato masher until fairly smooth. Alternatively, pulse with a food processor. Stir in the pork cracklings (or bacon) and salt to taste. Using moistened hands, form into 3-inch balls and serve warm. Yum! Sadly I didn’t have agave nectar so I used honey but these tasted great. Kids love them and that was the point. Thanks! I’m so glad you tried them! Thanks for letting me know they went over well. I’m making these today, Veronica!! They look amazing! Oh goodness – I just found this recipe and I must say, it is a new favorite. I just finished too! They are the best muffins I have made in a long time! Thank you so much for your wonderful site! I just love it. I have lost 73 lbs last year on weight watchers and I am loving trying all these new and ‘healthy’ recipes! THANK YOU THANK YOU! !